Had a 2.5.8 site where the integrated Capcha stopped working. Tried some things that others suggested, but nothing worked. Changed a line of code in the Recapcha php file as suggested in the Joomla Forum. Didn’t do anything. Regenerated new keys. Didn’t do a thing. I got it fixed by updated my Joomla core install from 2.5.8 to 2.5.11 and the capcha was working again. Recently ran into a jupgrade issue moving from Joomla 1.5 to 2.5. Everything was going fine till I reached migrating menus, just after migrating categories, then migrating content. 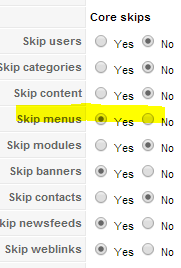 I was able to get through by skipping menus in the core skips found in the options of jUpgrade. I had “skip banners” checked as well but that wasn’t the issue. I went back and did the experiment a couple of times. I even deleted certain menu item at first, and then whole menus. I had no menus at all and it still failed. This skipped the menus, but it was too hard to rebuild the database and migrate the menus over manually. Joomla 2.5 dropped the sections and only has subcategories. Admintools to the rescue. I had an old download of admintools for Joomla 1.5. Installed this. Go to “Components >> admintools”. Click on “Database Collation”, and “apply”. Go back and run jUpgrade again. It should work. Here are links to the components I used.